The sad thing about friends moving away is that you don’t get to see their lovely face everyday. The good thing is you get to visit them and find new amazing tea rooms! A dear friend from work moved to Suffolk at the end of last year and last weekend another friend and I finally got the chance to visit her. Knowing me as she does she found a beautiful little tea room for us to visit in the quaint medieval village of Lavenham. My friend and I had hit the road early to find this rural retreat, winding our way through country lanes, the grey sky draping itself over naked trees, surrounded by muddy, fallow fields patiently awaiting spring. Amidst the grey February drizzle the new pad emerged and like a pocket of sunshine in the gloom there she was welcoming us with open arms. On such a dreary afternoon it is a struggle for anywhere to look appealing, but Lavenham still managed to entice us. Narrow streets lined with wonky cottages lead us to the village square, frozen in time you can visualise the bustle of a medieval market horse and cart now replaced combustion engines and sat navs! Tucked just off the main square is Lavenham Blue Tea Room. A stunning 15th Century listed building, it was once the village barber but now welcomes people for tea and cake. Amanda, the owner, welcomes you with a smile, a picture perfect tea lady with her pinnie round her waist, clutching a cosied tea pot. She was so accommodating, moving tables to fit in our party of 5 and making sure we were comfy throughout our visit. Amazingly this tearoom is set in the downstairs of Amandas home. Lovingly converted it displays nicknacks from her life including four generations of family photographs. A grammar phone plays in the corner transporting you back to the 1940’s as you peruse the RAF memorabilia. Lavenhams RAF base was utilised by the USA during the second world war leaving it’s international influence across this traditional British village. The artefacts and photos take centre stage on the white washed walls, framed by exposed beams and surrounded by antique furniture. The menu was a delight with locally sourced produce at its heart; the bread from the main square and scones from just two doors down, handy should they need a fresh batch. Breakfasts and brunches, soups and sarnies all homemade and hearty. I opted for the ploughman’s lunch, a platter to nibble on leaving room for cake of course! None of us were disappointed as the food arrived, fresh and delicious. The portions were generous with the cheese cut in slabs and the bread served in hunks. Thankfully there is no rush in Lavenham and we were free to graze as we chewed the cud. With time to rest before we embarked on cake I was ready for something sweet. The counter was laden with everything from traditional Victoria sponge to warming ginger cake and indulgent chocolate fudge. The toffee apple cake had caught my eye, topped with slices of fresh apple and doused in thick, gooey caramel dripping down it’s sides. To accompany it I ordered a pot of Assam, warming and malty it was the perfect brew. The lace covered tables were set with doily adorned plates, vintage china tea sets and cake stands. Dainty sugar cubes ready to be tonged and a china bell on each table which can be chimed to summon a free teapot refill. Our cakes arrived with a side of ice cream to compliment the flavour of the slice, for me vanilla and caramel. The cake was stunning, moist chunks of apple encased in light, gluten free sponge. The caramel on top was rich and smooth, the cold ice cream cleansing the pallet between each bite. The apple on top gave the slice freshness and crunch to contrast the soft, sweet apple within. All I needed was a sparkler and it’d be like bonfire night all over again! With our bellies satisfied we kept the afternoon nap at bay with some fresh air and a wander around the local antique store. This little village is ripe for exploring but both time and weather were against us on this occasion so we headed home. The perfect excuse to head back when the sun is shining! No matter the time of year Lavenham Blue Tea Rooms will bring sunshine to your day. The drives around the Suffolk countryside are stunning and the welcome you receive is whole hearted. So whether with new friends or catching up with old ones, order a refill and catch up over cake. Having a cheeky weekday off work can mean only one thing, time for tea and cake. With my other half and our four legged friend in tow we heading up to the Ashridge estate. I have been visiting this national trust site since I was a child. Memories of school trips to go pond dipping and collect soil samples, climbing trees and getting lost away from the beaten track. No matter the weather I have enjoyed long walks around the acres of forest, secluded meadows and rolling hills. We parked up near the Bridgewater Monument, named after a historic Ashridge resident, the third Duke of Bridgewater. The imposing granite column towers above the surrounding ancient trees allowing stunning 360 degree views from the top, thats if you can handle the 172 steps to get there! We stayed at ground level venturing deep into the forest, soon the groups of ramblers, horse riders and young families were far behind us. The dog ran free, picking up sticks far to large but his perseverance meant they were dragged for several meters. The spring canopy was filling up with new green leaves and a carpet of bluebells softened the forest floor. With wildlife all around us we walked and talked, building up an appetite for lunch. I have never seen a whitebell! Brownlow’s cafe is situated between the monument and the Ashridge visitors centre where you can pick up walking maps, books and gifts. All the seating is outside so opening times vary between the seasons but large umbrellas protect you from the worst of the elements if required. Dogs are welcome and lay strewn between tables or looking hopefully at their owners plates, wide eyed and waggy tailed. On offer is locally sourced produced on a varied menu of hot and cold dishes. An all day breakfast, or a jacket spud laden with tuna or cheese, baguettes and panini’s, fresh chilli con carne with crusty bread or home made quiche and salad. The portion sizes give exceptional value for money but you have to leave room for cake! Slabs of the classics such as lemon drizzle and carrot cake are on offer alongside chocolate brownies and muffins with plenty of tea to wash it down. Hearty brews to warm up walkers rather than dainty cups and saucers. I saw several people opt for the hot chocolate which comes pilled high with mini marsh mallows. I chose a cup of english breakfast to go with the locally renowned scone with jam and clotted cream, which didn’t disappoint. To say it was giant is an understatement, it was a scone on steroids!! Huge and fruit filled it bulged with enough cream to feed a hoard of ramblers. I felt the ratio of cream to jam was a little unbalanced and as they are preprepared you cant personalise the toppings. Never the less it was light, creamy, fruity and delicious! Despite the miles we had walked the scone beat me, but having polished off his more reserved slice of brownie my other half stepped up to assist. All the fresh air, exercise and cake made for a sleepy trio heading home. The dog, free from human chores, snored as preparations were made to head back to work tomorrow. In fact he still snores as I type…….it’s a dogs life!!!! There are some events you see advertised and they call out to you, almost as if it had been handpicked for you. On this occasion it was a journey through the chakras with a locally blended tea to compliment each, could it be more perfect? The evening was hosted by Real Remedies at the Tiki Cafe in Hemel Hempstead. The cafe itself is a stylish, independent coffee shop which holds a variety of events including open mic nights. They have an event room upstairs which is where our tea tasting would take place. Decked out with vintage furniture and retro art work it was an open yet chilled out space. Our hosts for the evening were James & Vanessa Jacoby, the co-founders of Real Remedies, the passion they have for their business shone through from the outset. Friendly and welcoming with a wealth of knowledge to assist those less familiar with the chakras and their qualities. From my yoga practice I have a basic understanding of where the chakras are but knew little else. I was in for an educational evening as we began our journey through the chakras, one cup at a time. We have seven principle chakras running up the centre of our bodies, each a unique centre of spiritual power. Linked to emotional and physical well being, blockages in these centres can have a negative impact on the way we feel. If our chakras are unblocked energy can flow freely around our body ensuring good health. With each chakra having its own distinct identity each tea in turn has it’s own distinct flavour to support and relieve the energy flow within us. Let’s make it clear that no medical promises can be made here but the ingredients for each tea are hand picked for their benefits in alleviating issues associated with each body part and aiding over all well being. We started at our base, the root chakra. This is at the base of your spine, grounding you to the earth and giving you a sense of safety and security. In the jar the fragrance was light and fruity, like summer strawberries. Once brewed it became deep aubergine in colour with a more spicy, cinnamon scent. I enjoyed the fruitiness from the strawberry and elderberry, and the cinnamon gave the grounding warmth. A comforting cup which could easily settle you if anxious, offering vitality when fatigued and perhaps bringing you back to earth when all seems a little out of control. Next up is the sacral chakra just below the belly button. Our centre of strength it inspires creativity and energy. In contrast to the first this tea was earthy with a hint of citrus, light brown in colour it gave a much sharper flavour. At fist sip I was not convinced, it felt like a pallet cleanser dominant with orange peel and nettle. As my palate adjusted to the tartness of this brew I grew to enjoy it. Although still fruity the citrus edge really gives this one a more stimulating feel, if you were low on energy or perhaps had a project to focus on this would certainly pep you up. I was already pleasantly surprise that I could easily identify the teas different personalities. The blends are complex but truly tune into different sensations. We continued on to the Solar Chakra. This is just above the naval and we have moved up to the centre of confidence and will power. It had similar citrus tones to the last but lighter and fresher. An underlying warmth from cinnamon gave it a peppery edge. The lightest in colour of the teas so far it appeared golden in the cup. It felt like powerful brew, packing a punch and awakening the senses. This would be great after an over indulgence as the blend of flavours perked me up yet calmed and settled my stomach. It’s feisty flavour may help inspire you to regain control and take action where its needed. Half way up we reach our heart chakra, unsurprisingly at our heart. It is central to us feeling balanced and content. Finding peace here can open us up to love and compassion whilst quietening our self critic. Fairly bright in colour it was yellow with a hint of green in the cup. The jar gave a light floral fragrance with a hint of mint. I found it very soft on the palate, gently warming as the fennel and spearmint complimented each other in perfect balance. This was an easy one to drink, smooth and soft it brought about a sense of peace. A cup would give you a window of stillness in the busiest of days, time to compose yourself and persevere. Next we reach the chakra that represents expression and authenticity, the Throat Chakra. This is one I have an affinity with as if I am struggling to communicate something or my creative expression is stifled I often feel it in my throat. I was interested to experience this tea and how it may alleviate blockages here. Speckled with powder blue corn flowers the blend is aromatic with liquorice and cloves. The flavour not as strong as the scent which was a pleasant surprise. The light catches a slight blue tone in the brew, smooth across the tongue it almost caresses your throat on the way down, perfect if you’re feeling any tension or a sore throat. This soft brew felt very smooth to drink, relaxing and enabling you to express yourself with authenticity. Our penultimate chakra is the 3rd eye, placed on your forehead just between the brows. As we rise up through the chakras we also rise up from the earth. Away from the more grounding centres to the place of intuition and wisdom. This blend is light with a purple edge to it, breathing in a more heady and aromatic scent. Caraway, marshmallow root and star anise work in harmony along with fruity notes that lift your attention up and beyond the 3rd eye. This cup is one to enjoy if you’re lacking concentration and need to reconnect the mind and body. So finally we reach the heights of the Crown Chakra, right on the top of the head. There is really no limit to this energy centre as it connects you with all that is beyond. The brew is floral with rose petals, rosemary and lavender combining to relax and unite you. The scent is uplifting and the flavour warm with nutmeg. This is a cup to make space for, enjoy it as it swirls around your senses and be as ease. Each of the blends is a joy to the eye, colourfully speckled with dried fruit and flowers. Flavours that I would not have normally tried where combined in a unique way. I enjoyed the experience of being talked through the chakras and how the ingredients were hand picked to compliment each energy centre. 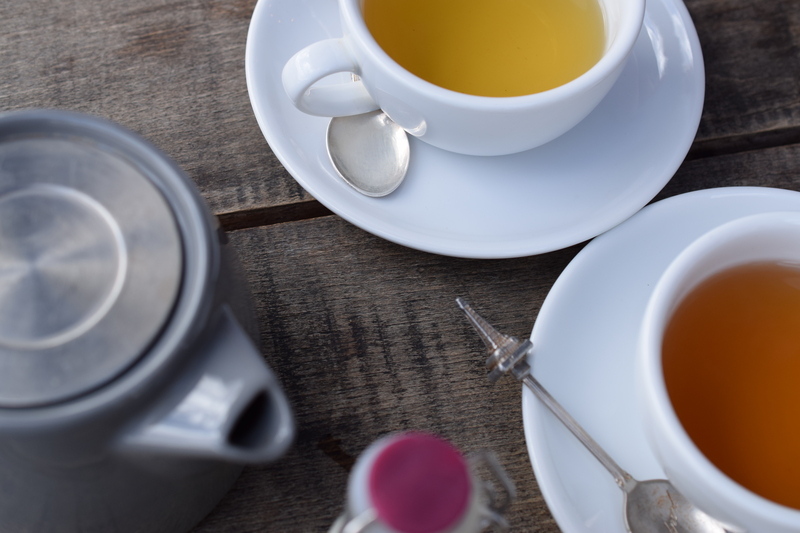 Of course you can enjoy these teas for what they are, naturally delicious, but tuning into your body and sensations of each brew added a new eye opening level to enjoying a cuppa. Real Remedies also offer tinctures and tonics of their blends to harness the power of nature to aide the body, mind and soul. Put the kettle on and enjoy a different kind of brew, with an inquisitive mind and an open heart you may find the perfect brew for you. You can learn more about other events and workshops or buy on line at Real Remedies website. Last Friday I celebrated my Thirty *Ah-Hem* birthday. Having the day off work was the perfect opportunity to visit a little place that had caught my eye. Each day my journey into work takes me down a narrow country lane on which I often get stuck in slow traffic. Although the lack of speed can be frustrating it does allow you time to notice things that often pass you by. Just the other week a sign caught my eye for “Three Wise Monkeys, Vintage Emporium”. The first thing that springs to mind is that we don’t have enough emporiums these days. Imagine a world of food emporiums, shoe emporiums, wine emporiums! Sounds like a wonderful place doesn’t it? I am aware of a chain of opticians called the Eye Emporium which conjures up such amazing images of glass cabinets, weird and wonderful trinkets and drawers full of eye balls (FYI it’s your standard opticians but one can imagine!). This was not a sign I could turn a blind eye to. Off we went down rain soaked lanes to seek out the emporium. It’s hard to spot at first as its part of a large Osprey outlet center and the Three Wise Monkeys sign was not obvious from the road. Tucked around the back of the high end barn conversions is a treasure trove of all things vintage. Welcomed by a small tea room your eye is immediately caught by the bespoke furniture and shelves of antique crockery. Chunky wooden tables surrounded by beautifully upholstered farmhouse chairs. The stools at the breakfast bar are converted tractor seats, stark and metallic against the natural wood and kitsch finishes. A door in each direction beckons you to explore but which way first? Being a converted barn everything is charmingly wonky, exposed beams and wooden floors. Every nook and cranny is filled with treasures from bygone eras. Each room is divided up into sections for individual stall holders, all with their own unique style. From Old street signs and gardening equipment, glassware and pottery, clothing and handbags, up cycled tables and chairs, artwork and lighting, jewelry and gifts. My eyes couldn’t rest, flitting from one to the next, down low, up high, every inch another discovery. After perusing we took a rest for lunch and cake before going back for more. The cafe is beautiful and all the furniture is up for sale so if your chair is comfy you can take it home! The menu was comforting, just what we needed on a chilly damp day. A cheese toasty each and a huge sausage roll to share, delicious buttery pastry encased flavorsome pork and chili filling. You can have it served with salad and coleslaw which would be a meal in itself but we had to save room for a slice of cake, it’s my birthday after all! It was disappointing that the cakes aren’t homemade but the site has a trade only license so doesn’t have the facility to cook things from scratch. The brought in selection was vast including coffee and walnut, raspberry and white chocolate slice, chocolate brownie and an array of muffins. My partner in cake beat me to the raspberry and coconut slice which had caught my eye, so I opted for a slab of the orange and poppy seed sponge. The slice had a firm layer of pastry and ample raspberry jam topped with a coconut sponge, desiccated crumbs tumbled with every bite, it was a joyful mess to eat. The orange sponge was flecked with poppy seeds giving each mouthful added texture. The freshness of orange was a welcome twist on the familiar combo of citrus and seed. The sponge was heavy but flavorful, mildly complimented by thin layer of zingy icing which could have been so much more indulgent; caterers are perhaps a little stingier with their stock than home bakers! Never the less the serving was substantial and gave me the energy I needed to get back out there and shop! The question you have to ask yourself is, when was the last time you visited an emporium? If it’s not been recently, or at all, you must venture out to Three Wise Monkeys, my only advice is to cover your eyes if you don’t want to be tempted by the beautiful antiques on offer, cover your ears if you don’t want hear the stories behind the unique pieces of art and cover your mouth if you want to resist the delicious tea room! Be sure to check out their WordPress blog or Facebook pages to find out what they have going on.